Dr Geraint Jones and Dr Chris Arridge from the UCL Mullard Space Science Laboratory (MSSL) have discovered tiny, electrically-charged icy particles in the plume from Saturn's moon Enceladus, offering a glimpse of the interior of the celestial body. Dr Jones and Dr Arridge presented their results on behalf of the Cassini Plasma Spectrometer (CAPS) instrument team today at the European Week of Astronomy and Space Science (EWASS) conference at the University of Hertfordshire. The researchers have been working on the Cassini-Huygens mission which has been exploring Saturn and its moons since 2004. The Cassini instruments have found active jets near the southern pole of Enceladus, discovered in 1789 by William Herschel. These jets spew gas and water out into space over thousands of kilometres. The mission is a collaboration between NASA, the European Space Agency (ESA) and Italian Space Agency (ASI). The CAPS instrument detected tiny ice grains whose traces could only be present if they were electrically charged. These grains, probably only measuring a few nanometres in width (50,000 times thinner than a human hair), fall between gas atoms and much larger ice grains in size, both of which were sampled directly during previous Enceladus fly-bys. The particles have both positive and negative electrical charges, and the mix of the charges varied as the Cassini spacecraft crossed the plume. During two close fly-bys (a close approach to a celestial body for the purposes of observation) of the moon in 2008, skimming only 25 km and 52 km from the surface, the CAPS instrument on the spacecraft was pointed to scoop up gas as it passed through the plume. Drs Jones and Arridge suggest that the grains may become charged when they bump into each other in the vent below Enceladus's surface before they emerge into the plume. This provides important hints to the conditions in the vents and, in turn, may help scientists understand conditions of the interior. Dr Jones commented: "What are particularly fascinating are the bursts of dust that CAPS detects when Cassini passes through the individual jets in the plume." Dr Arridge added: "Each jet is split according to charge. Negative grains are on one side, and positive ones on the other." As these charged grains travel away from Enceladus, their paths are bent by electric and magnetic fields in Saturn's giant magnetosphere (a highly magnetised region around an astronomical object). In this way Saturn's magnetosphere allows astronomers to measure the masses and relative concentrations of atoms and molecules. Dr Arridge has begun modelling the paths of these newly-discovered particles. Ionised gas (plasma) in Saturn's magnetosphere flows past Enceladus at over 80,000 km per hour. Dr Arridge's results show that for these dust particles to reach Cassini, this river of plasma must be slowed down, in and near the plume, to less than 3,200 km per hour. These new results provide further evidence that the material in the Enceladus plume has a huge influence on the moon's surroundings. Future Cassini fly-bys will help further understand the processes that occur at Enceladus and in its vicinity. Observations from the Cassini Plasma Spectrometer (CAPS) made during the Cassini fly-by of Enceladus on 12 March 2008, superimposed on Cassini's path. 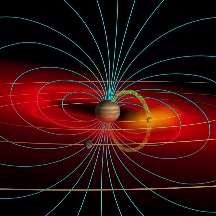 As the spacecraft passed the moon, CAPS detected streams of charged particles in individual jets within the plume; negative particles are shown in this view. Established in 1966, the UCL Mullard Space Science Laboratory is the UK's largest university-based space science research group. Its projects range from the study of Earth's climate to investigating explosive events that occurred at the very limits of the known universe. The MSSL has established an international reputation for developing highly innovative technologies in space science. The centre has participated in over 35 satellite missions and over 200 rocket experiments. It has the unique capability of designing, building and testing instruments and other spacecraft systems on site. It offers courses on space science engineering, technology management and project management. MSSL staff are also committed to a broad outreach programme such as running websites for a general audience and organising school trips to the centre.